Wayne College is a campus of the University of Akron, serving Wayne, Medina and Holmes Counties. for science labs and the new maker space. During the past year, the Wayne College 3D printing initiative stimulates student interest in 3D printing, CAD design, and creating. Current engineering classes integrate the technology via printed parts for LEGO Mindstorms robots, material stress testing, and into students’ own personal projects. The Laura B. Frick Charitable Trust funded the college’s first 3D printer. The Romich Foundation provided a second 3D printer and a portable printer for offsite demonstrations. Since then, the 3D printing initiative has seen impressive growth in its academic application and community involvement. Students use the machines to enhance engineering courses such as Tools for Engineering with customized model rocket designs. Out of all of the rockets built last year, a 3D printed model outperformed them all. 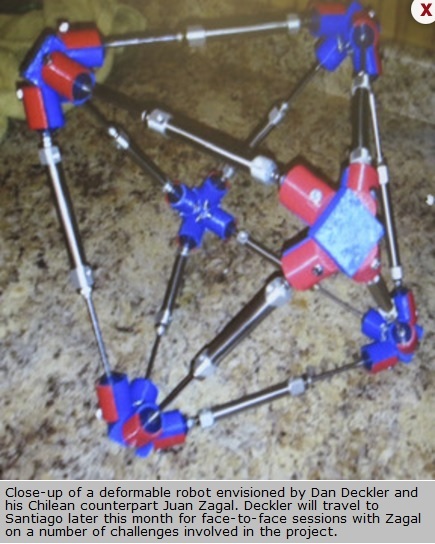 Last semester, students used 3D printers to create parts for the robotics class, including weighted objects that are thrown from the robots using MatLab to calculate motor strength and speed to achieve a predicted throwing distance. 3D printing allows new content to be taught in existing classes. Dusty Ball (an engineering student) assisted with teaching students how to design and print working engines made from plastic. Students created flywheels, pistons, and camshafts, all not possible before the 3D printing initiative. In the community, Wayne College has connected with and assisted numerous local businesses and organizations, including Akron Brass, Cerco, Coiltek, Daniel’s Amish Collection, Lion’s Club, Millersburg Rotary, P. Graham Dunn, Orrville Boys and Girls Club, Shantz Organ, United Disability Services, Visioneering Bio Design, Wayne County ASME, and The Wilburt Company. The lab designed new parts, printed prototype parts, offered workshops & tutoring sessions, and provided onsite 3D printing demonstrations. The college has also been heavily involved with local schools including Heritage Christian School, Kingsway Christian School, Northwestern Middle School, Orrville City Schools, The University of Akron Human Powered Vehicle Team, and Wooster High School. It offered onsite 3D printing demonstrations, assisted with the development of the Northwestern Middle School’s “makerspace” initiative (we received an award for that), brought groups of students to Wayne for CAD design and 3D printing lessons, and more. Given only 12 months since inception, the 3D printing initiative has grown amazingly fast. 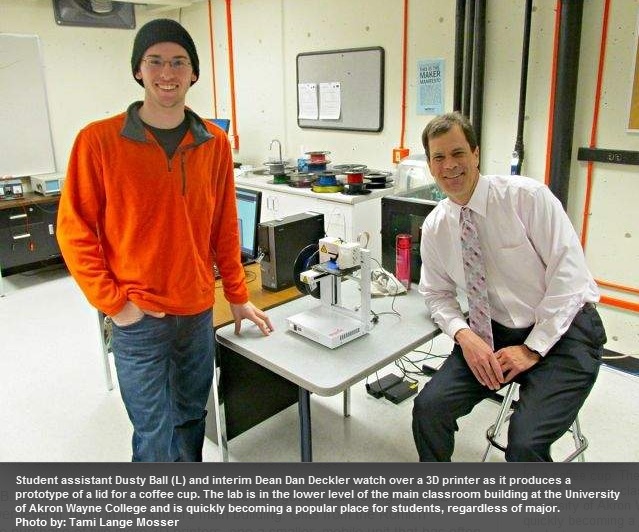 The Wayne College 3D printing lab and accomplishments have been mentioned numerous times in local newspapers such as The Daily Record, The Wayne County Bargain Hunter, This Week, and others. The 3D Lab is a hub of student activity and excitement, a place for students to hang-out, do homework, collaborate on projects, and create things. Click here to view the weekly blog of the Wayne UAWC³ Lab. ORRVILLE -- What do a military aircraft preservation group and students in a college 3D printing lab have in common? 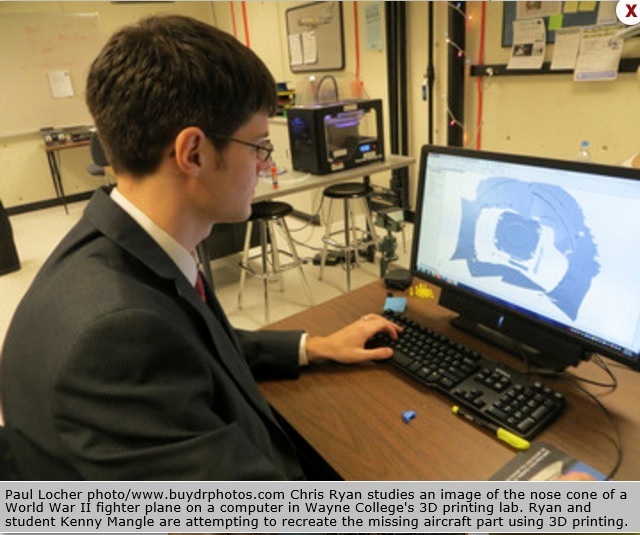 When aircraft restorers working at the Military Aviation Preservation Society in Canton needed an unobtainable part for an F-86F Sabre jet, they turned to students in the 3D printing lab at the University of Akron Wayne College to see whether it might be possible to create the part on a printer in the college's Makerspace. In January, the MAPS group enlisted the help of students Chris Ryan of Apple Creek, a sophomore majoring in mechanical engineering, and Kenny Mangle of Dalton, a sophomore majoring in aerospace systems engineering. Tom Hammond, instructor in the 3D printing lab, said his initial conversation with MAPS restorers was last year. They were interested in having a nose cone for the fighter plane, which is undergoing restoration at Akron-Canton Airport, recreated using a 3-D printer. Like most of the aircraft at the MAPS museum, the F-86F Sabre is being restored to display condition, not to flying condition. Hammond noted automobile collectors, such as comedian Jay Leno, have used 3D printing to make parts for use in car restorations. The part that is needed for the MAPS plane is a nose cone that covers a radar unit mounted directly behind it. The part is about one foot square, too large, Ryan said, for the college's small printers, but which could be fabricated in multiple pieces that could be formed to lock together. So, on a recent afternoon, Mangle and Ryan packed up the lab's 3D scanner and transported it to the MAPS museum. Ryan said the weather that day was snowy and frigid, forcing the museum to be closed to the public. So the two Wayne College students had the cavernous building largely to themselves. To take the measurements of the space the new nose cone would need to interface with, the students improvised a stand on which they mounted the 3D scanner level with the opening. Ryan took some extra time to mount his Go-Pro camera to take time-lapse photos of the three-hour project, which he later turned into an instructional video. Using laser technology, the scanner traced thin red lines across the void left by the removal of the old broken nose cone, storing a series of measurements and curvature alignments in the software. According to Ryan, the scanner "takes lasers in vertical lines and measures the reflection and width between the lines." Ryan characterized the project, which he hopes to have completed by the end of the year, as "a great challenge," due not only to the size of the part, but to its complex curvilinear patterns. "We're doing this totally on our own," said Ryan. "It's not homework, so we'll work on it as we get the chance. It will look great on our resumes," he laughed. "They're really stretching themselves on this," said Hammond. "They're self-motivated, which is good because you learn a lot more that way. It's a big win-win." Noting the part could take 16-24 hours for a 3D printer to complete, Ryan said the job may be taken to the Thinkbox at Case Western Reserve University in Cleveland, where large-scale 3D printers are available for public use, with operators paying only for materials. Reporter Paul Locher can be reached at 330-682-2055 or plocher@the-daily-record.com. He's @plocherTDR on Twitter. Just nine months ago, computer lab #3 at the University of Akron Wayne College was just that. But in less than a year, that space has become a 3D prototyping center, a place not only for engineering majors, but for students of all ages. The Orrville Area Boys and Girls Club children have learned how to create rockets, students at Northwestern High School are learning the ropes, and the Wayne College community has found the lab to be one of the most popular spots on campus. And interim Dean Dan Deckler said it’s only going to better, and hopefully bigger. It was a grant from Laura B. Frick Foundation–PNC Bank Trustee that got the ball rolling. One 3D printer was set up in a lower-level IT room in the school’s main building. Gifts from the Romich Foundation allowed for the purchase of two more 3D printers, one a smaller, mobile unit that has often been taken on the road for demonstrations. An arrangement with the Boys and Girls Club brought in resources for a vinyl cutter and a 3D scanner. It quickly become apparent the enterprise needed a bigger space, so the computer lab underwent a quick cleaning and conversion. Next up, lab support specialist Tom Hammond said, is a laser engraver, also a gift from the Romich Foundation. But what does all this equipment do? According to student assistant Dusty Ball, just about anything you can imagine. The lab’s computers are loaded with different computer-aided design programs that allow the user to create everything from a coffee cup lid to components for an engine to sliding door rollers to robot pieces and parts. Once the design is completed, it is sent to the printer, in the same way print documents go to traditional 2D machines. The prototype is “printed” a layer at a time, in layers anywhere from 0.01 mm to 0.45 millimeter thick. Deckler likened the process to putting soft-serve ice cream into a cone, building it up layer by layer, except each layer is slightly less thick than a sheet of paper. It takes time, Ball said, maybe four to six hours for some projects. Still, he said, the new equipment makes projects affordable. “They’re learning from their mistakes,” Ball said. “If you mess up, you’ve messed up a dollar, a dollar fifty” worth of material. The technology has been around for 20 years, Hammond said, and over the years has become more affordable. A 3D printer can be purchased online and designs can be downloaded from websites like thingiverse.com. “It’s like a Netflix for parts,” Ball said. Other schools offer 3D printing to students, Deckler said, who can bring their files in on jump drives and ask a lab tech to print it. At Wayne, he said, students can do their own designs in the lab and see their projects through from beginning to end. Ball recalled one Wayne student who came to the lab in search of a holder for a game console. “He’s a business major, not an engineering major,” Ball said. Still, he was able to design and print what he wanted. “Curiosity is what drove him,” Ball said. Already, Deckler and Ball are envisioning a new building for the lab, and Deckler has already been talking to a professor in Chile about a project that could give the lab its first international experience. The man is looking to prototype pieces for a robot that could change shapes, allowing it to move through tubes and pipes and morph to make its turns. 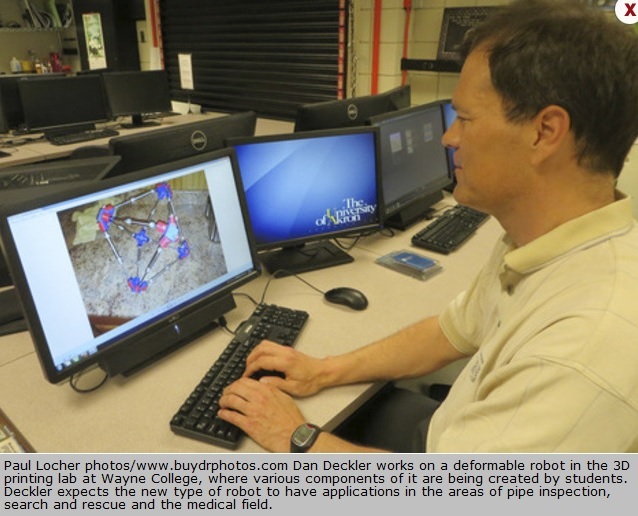 ORRVILLE -- Some students at the University of Akron Wayne College will have an opportunity to participate in an international engineering project this year, thanks to the efforts of professor Dan Deckler. Deckler is working on the cutting edge of a new technology called deformable robotics. He will travel later this month to Santiago, Chile, for a weeklong collaboration with another pioneer in the field, Juan Zagal of the University of Chile. Deckler and Zagal are working to design a flexible robot capable of altering its shape, which they envision being used in numerous applications. The Wayne College professor said he was put in touch with Zagal three years ago by a friend he made at the U.S. State Department while serving as a Congressional Fellow on the House Science and Technology Committee in Washington, D.C.
Deckler said until Wayne College got its first 3D printer and began developing a Makerspace, there had been no way to create parts for the robot. Now, however, working in conjunction with Jeff Davis, a senior design student at the University of Akron who will accompany him to Chile, the components can be designed and created in the 3D printing lab by Wayne College students. Among the issues Deckler said he and Zagal will grapple with during their meeting are such things as control software, making the robot smaller and more responsive, computer interfaces, documentation of results and discussing possible power sources. Travel expenses for the Wayne College team are being underwritten by a grant from the Romich Foundation, which has been instrumental in providing a variety of 3D printers and related equipment to Wayne College. Deckler said the robot could be powered either by hydraulics, electricity or pneumatics, of which the latter looks most promising. What sets this robot apart, Deckler said, is it has the ability to deform itself and move around corners. He compared its movement to that of an inchworm in crawling along surfaces. Deckler said he believes the robot would have a trio of immediate applications. The first would be in pipe inspections, something which has attracted the attention of the U.S. Navy. He noted the Navy currently uses camera-equipped "pigs" that it sends through miles of piping on ships. The problem, Deckler said, is the pig is unable to make turns. The second use, Deckler said, would be in the area of search and rescue. He said the robot could flatten itself in a confined space while adjusting its shape as it crawled through rubble. Already looking ahead to when the robot could be developed in nano form, Deckler said it could be used within the human body to crawl down blood vessels and inspect for blockages or thin walls where an aneurism could occur. Among the many challenges in that arena, Deckler said, are creating on-board micro-miniature computers, power sources and cameras the robot could use. "There are all sorts of possibilities with this," said Deckler, adding the biggest immediate advantage will be in allowing Wayne College students to work internationally on an engineering challenge. "This will be a real success if our graduate students can collaborate internationally with their counterparts in Chile. It will help both sets of grad students to understand that we're living in an international world," Deckler noted. Deckler recently announced he would step away from his position as interim dean to return to teaching. He said he wanted time to pursue robotic development, noting working with Zagal would be "the opportunity of a lifetime. I have to take it."